Who would tu rather hang out with? la elección de los fans: 2) Hikaru. If tu could imagine all of the Host Club members as different dog breeds, which breed would they be? Hanianika: what do tu like? Hanianika: ok do tu like sushi? Britney(me): Hi guys! In this tu get to ask the Host Club preguntas and they will answer. Also 6 lucky ladies will get a happy ending with a host. Kyoya has known Mai Inoue since he was young, but they stopped talking for years. What will happen when Mai asks to registrarse the host club as a secretary? Haruhi had enough, this was the straw that broke the camel’s back o in this case the dulces cane that broke the reindeers back. For instance, the twin elves up to their seducing of the Ouran High School ladies, once again. Along with the blond haired Santa without a beard, a reindeer with glasses and a notepad. A talking gingerbread man with a bunny and walking navidad árbol beside him. a reply was made to the forum post: OHSHC misceláneo sentance maker!!!!!! 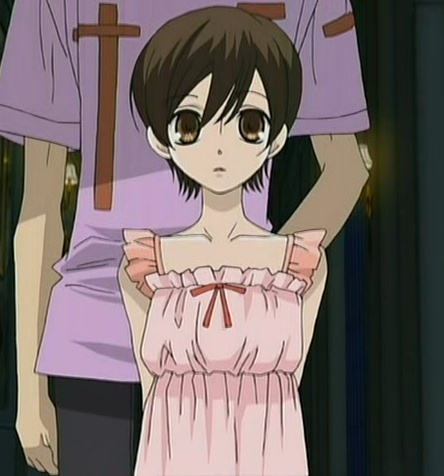 In the Manga, when the Twins put the foto of Haruhi on their website, who's body did they put her head on? Which Host Club member do tu think you're most like?